Potential World Record Shrimp Used As Bait! The picture below is all that remains of what was a potential WORLD RECORD White Shrimp! 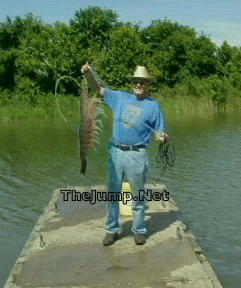 The shrimp, estimated at about 20 pounds, would easily have eclipsed the present world record of .56 pounds! Area biologist Mike Guerin was visibly distroughtafter talking to the angler while investigating the incident. Mike Guerin has been working with the Trophy White Shrimp Program (TWiSP) since its inception back in 1990. Mike Guerin has long been criticized by scientists in his field of work because of what many consider to be outlandish claims. Mike has long claimed that a Super Strain of White Shrimp have long inhabited the West Louisiana Coast. He reports weights even bigger than this one pictured below allegdly caught years ago by his Grandfather. Mike Guerin has been trying to capture one alive to prove his claims to his detractors and to jump start TWiSP, which he hopes will help curb world hunger. The angler pictured below William Pope, didn't realize the significance of his catch. The story goes that Pope was piddling around his camp one morning and decided to see if any trout were near his dock. He wasn't having much luck with his "Top Dog" and was about to quit. That's when he made one more cast. Halfway through the retrieve there was a huge explosion behind the bait. He set the hook but missed. He quickly cast again and immediately the top water plug was hit again. This time the hook found its mark and the fight was on. It took almost 1 hour to land the shrimp. He described the fight as unusual. "The shrimp was jumping and jerking around so much that it nearly tore my arms out of their sockets." He was quoted as saying that he never would have landed the shrimp if it had simply run away, but it was coming towards him almost as often as it was pulling away. The fight ended when the giant shrimp jumped out of the water and landed on the pier. Not realizing the significance of his catch he brought the shrimp to the camp house and requested his wife whip up some Shrimp etouffee! She agreed but screamed when she saw it and told him to get that thing out of her house! So unbelievably he put the shrimp in his boat. Went to the rock jetties and proceeded to use the shrimp for bait. His reward. HARDHEADS!